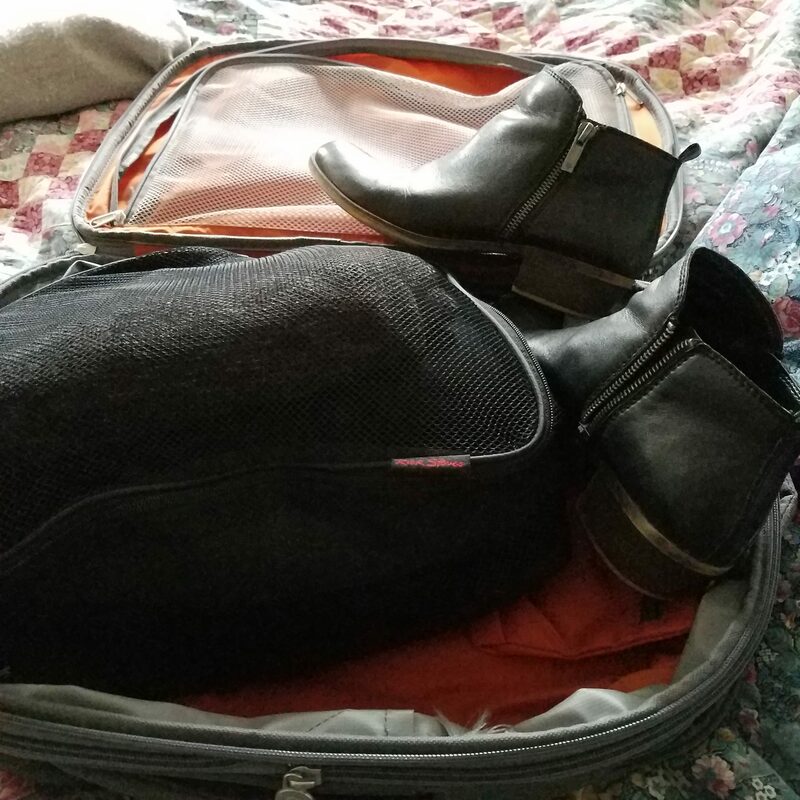 I recently took a business trip to Geneva and, thanks to my finally-optimized wardrobe, packing was extremely simple and efficient. I thought I’d run through what I packed and wore during this trip. I also brought my leather work tote, which held almost nothing when I left, but was great for stuffing my down coat into once I was through security and not going outside for a good long while. 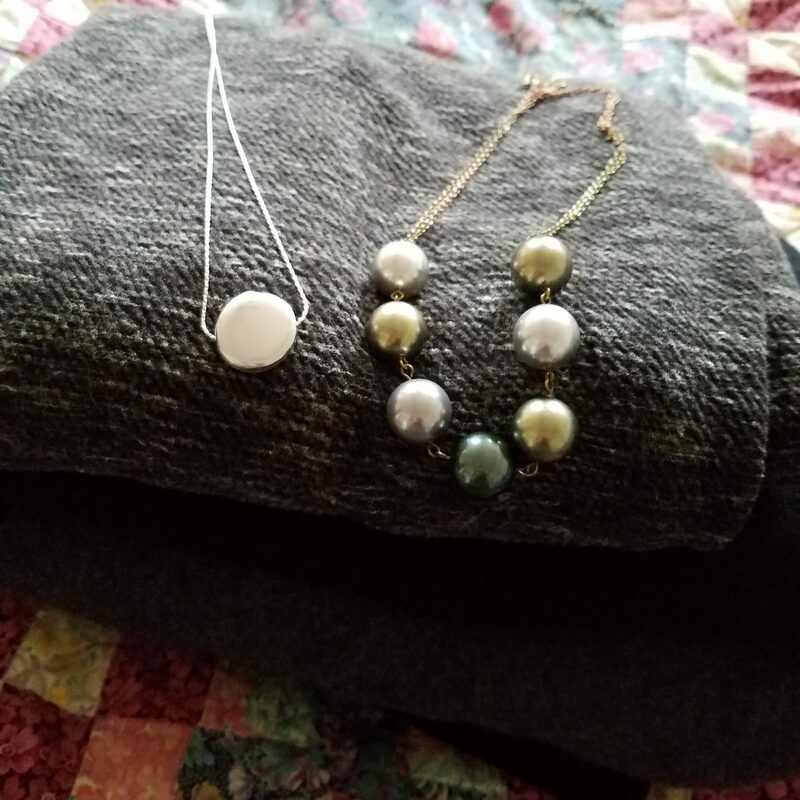 For travel days, both coming and going, I wore the artist’s smock, black jeggings, and the Poetry cardigan. 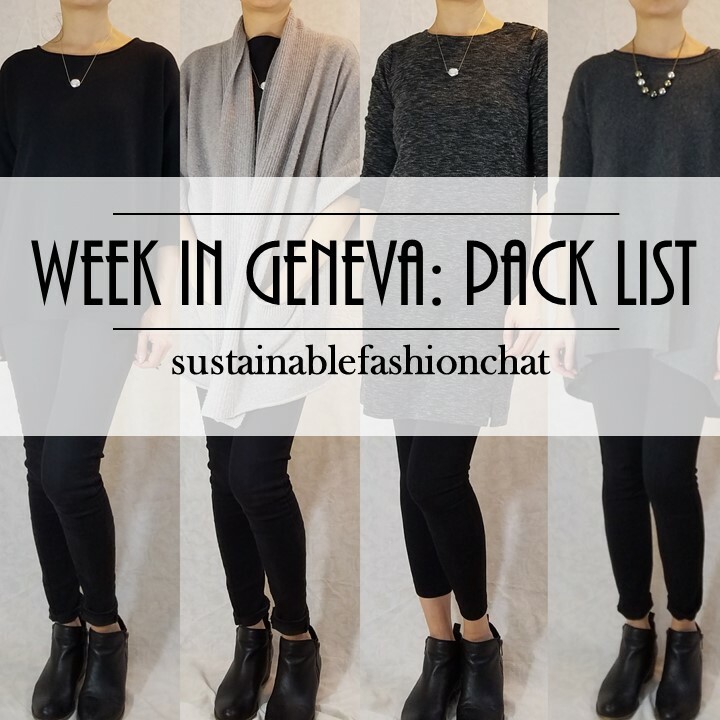 The skinnies were great because they are super comfy, with a wide-band, non-binding waist, and paired with the artist’s smock, I was dressed enough to hang in the business lounge or wander around the streets of Geneva and feel totally put together. The cardigan was also a nice layer to add on or take off, depending on how warm it was in the airport / on the plane. When I landed on Monday, I had some time to drop my stuff at the hotel, and do a little exploring around the city before grabbing some dinner and heading to bed. 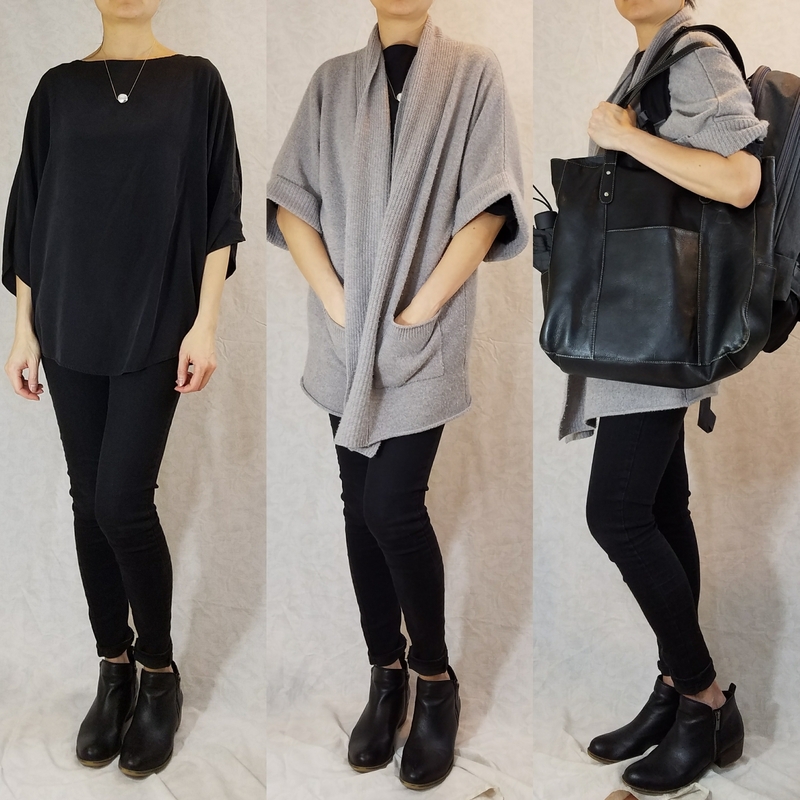 I was in all-day meetings Tues-Thu and started the work week off with the black cashmere sweater and black jeggings. You just can’t go wrong with black in Europe. Plus, I was nice and warm in my cashmere. 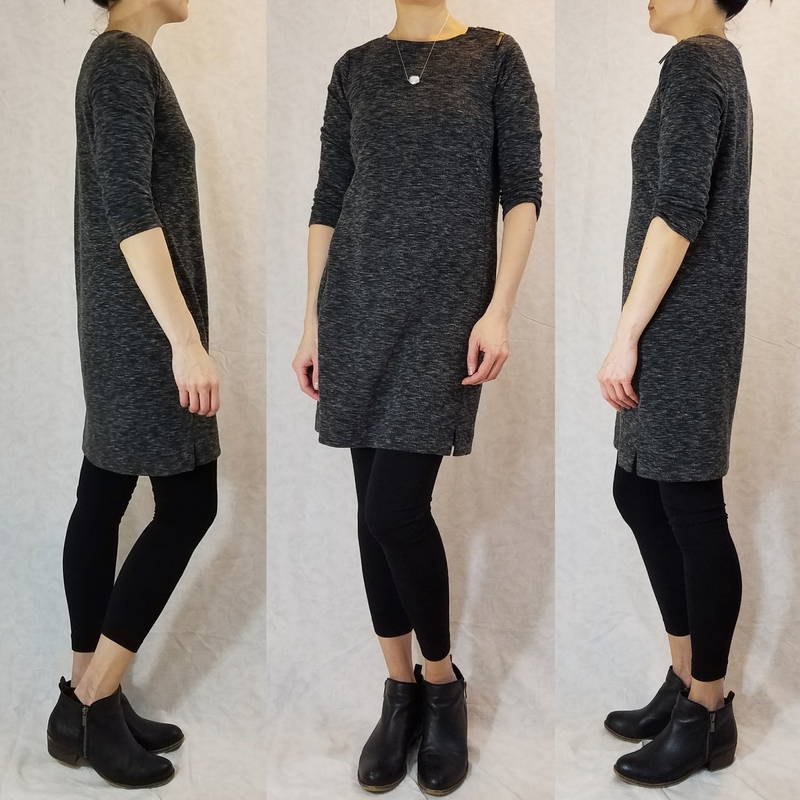 Wednesday I went with the charcoal tunic and black ponte leggings. Thursday was our last day of meetings and we had a team dinner in the evening. I went with the Loft dress and black leggings. 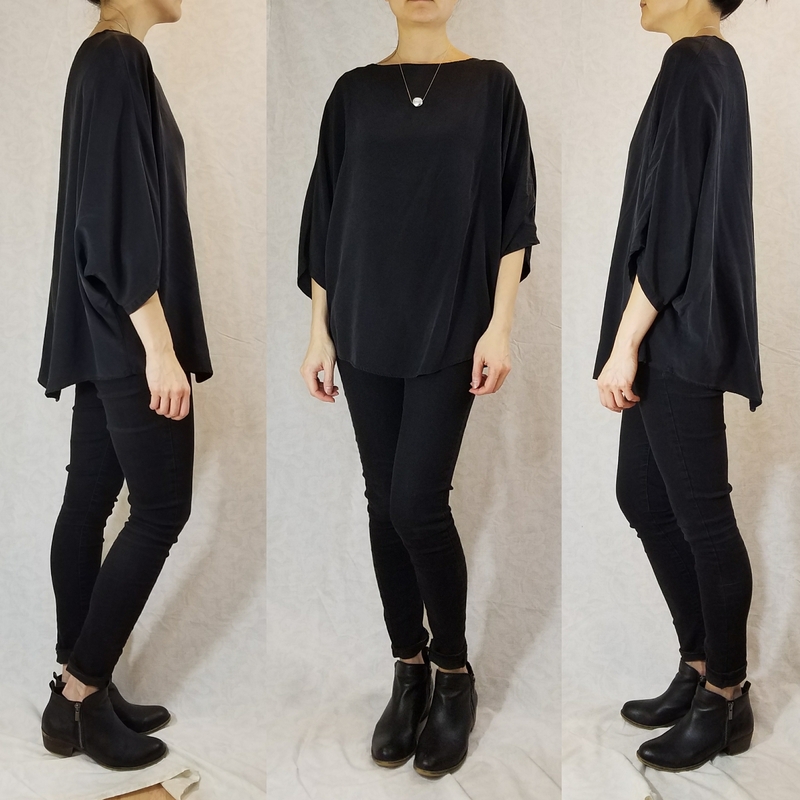 Friday I traveled back in the same outfit: artist’s smock, black jeggings, and cardigan. 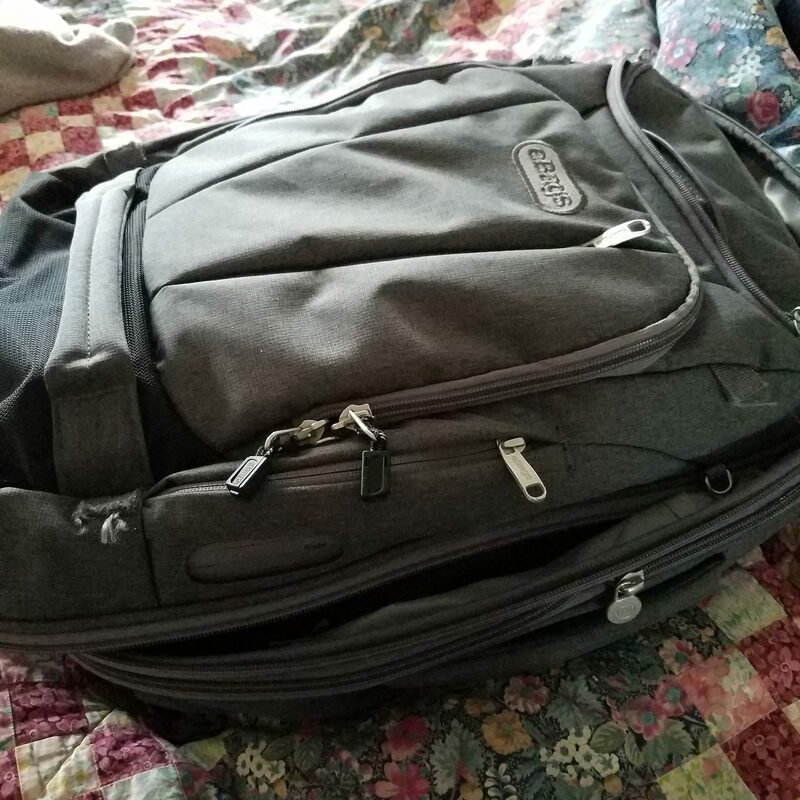 Here you can see the size of the tote and my suitcase. I like not having to drag a wheelie bag. Makes it easy to take stairs, navigate through crowds, etc. 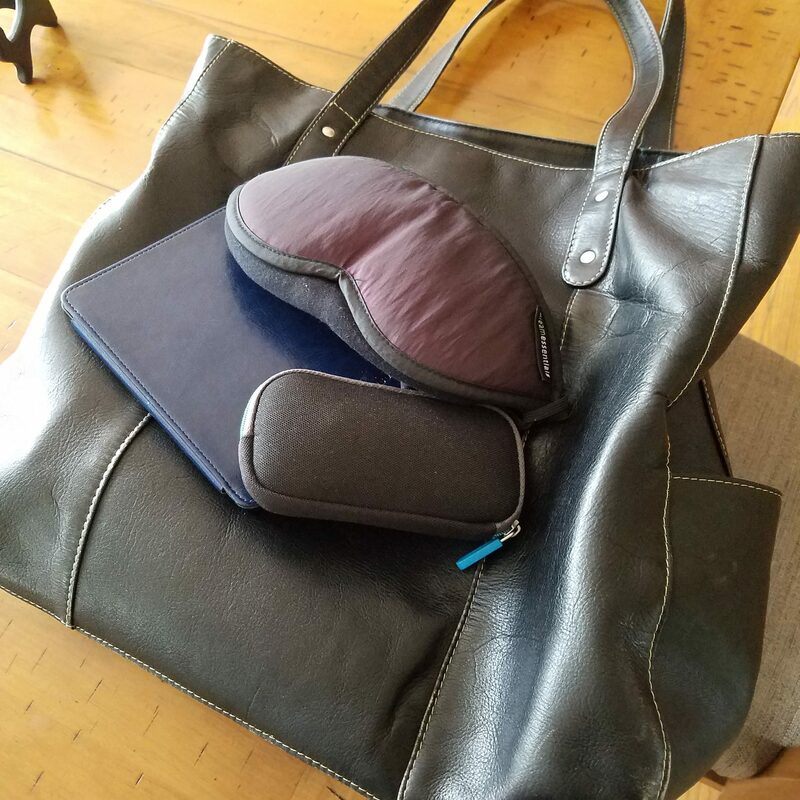 The three most important things I brought for travel-happiness were: eyeshades, my Kindle, and my Bose headset. I was happy as a clam reading my book, or, if I wanted to relax even more, listening to an audio book or watching a movie. The eyeshades were perfect for sleeping even if the lights were up in the cabin. Obviously, I’m not much of a re-mixer. I pretty much brought separate outfits for each day and didn’t really mix and match. 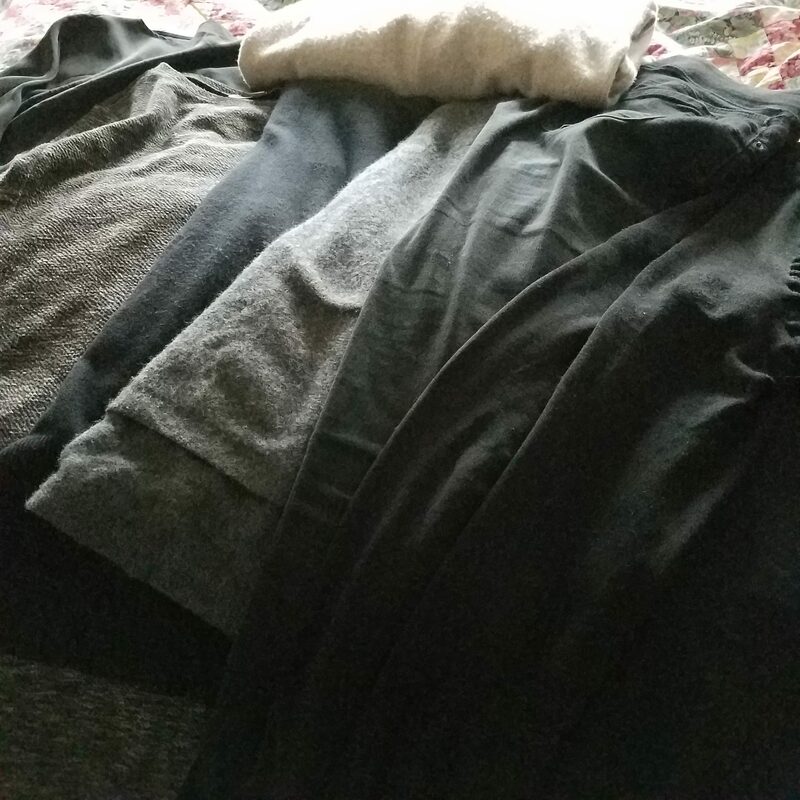 I also brought three black, skinny layers for bottoms. Redundant? Maybe. But I don’t think the pieces are really interchangeable in my outfits. Either way, they don’t take up a lot of space, so it’s no problem to bring them all. If I were to have stayed another week, I don’t think I would have packed any more than what I had. I never wore the artist’s smock or the cardigan to the office, and I easily could have, so I think I would have had plenty to wear, even for two weeks. 2017 year in review and my one purchase for 2018?